Last summer, my husband and I spent a beautiful afternoon at Cates Park in North Vancouver, BC. I journaled about what I saw, heard, smelled, and felt while we were there, and later organized my notes into a loose type of poetry. 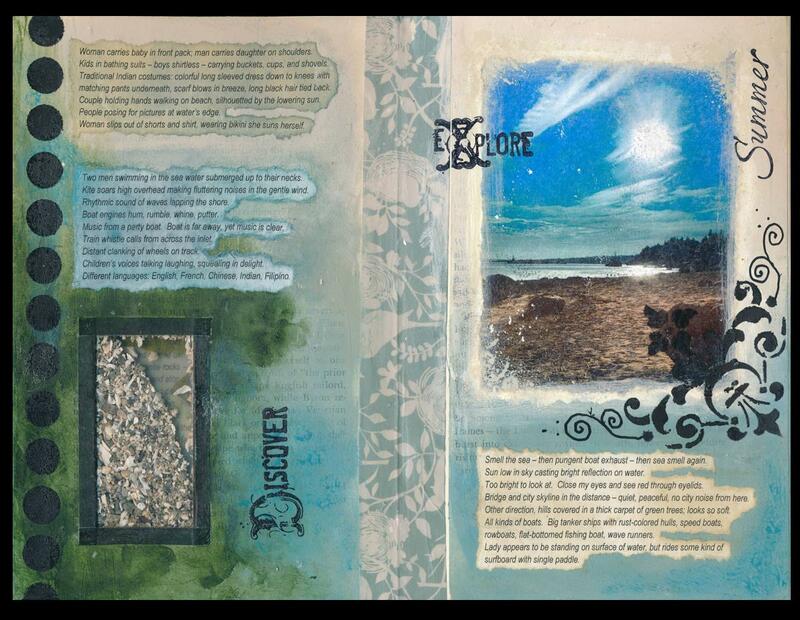 These two journal pages include the text I wrote that day, along with some of the “artifacts” I brought home with me: a sand sample (encased in a plastic niche I carved into the page) and sheets of real seaweed. 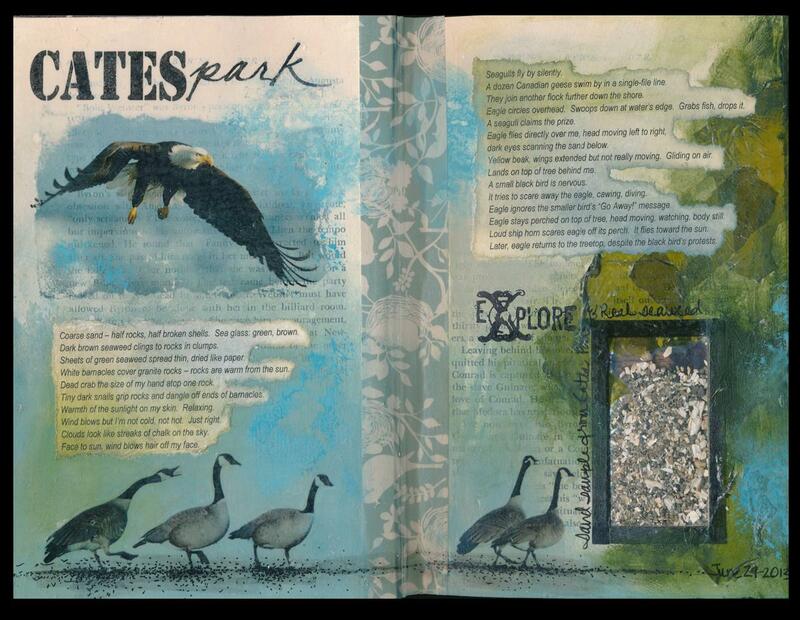 I used photo transfer techniques to include images of an eagle, Canadian Geese, a photo we took that day, and the title “Cates Park”. The page background was made using acrylic paint applied with a baby wipe, and I applied washi tape to the spine (because it threatened to split apart). The seaweed (shown on the left page) was fun to work with! I found it stretched across rocks on the beach, dried paper thin. Using Mod Podge, I glued it to the page. It got a little slimy while wet with adhesive, but dried completely flat. To make the sand window, I carved a rectangular niche through approximately 20 pages using a craft knife, and then glued those 20 pages together to form a thick block of pages that is about 1/4″ thick. I encased a transparency sheet at the front and back of the niche, and filled it with sand that I collected at the beach that day. To even up the edges, I framed the niche with black washi tape, front and back. The sand moves around within the window as the page is turned or the book is moved. Around the time I made these pages, I taught a Photo Transfer Technique class at Scrap Arts that included four completely different methods for transferring laser printed images into artwork. I used two of those techniques here: the Gel Medium Method (title, geese, eagle) and the Acrylic Paint Method (beach photo). What’s fun about photo transfers is that unlike collaged elements, you can see through photo transfers to the painted background behind them. That’s why you can see the original book text peeking through the sky that surrounds the eagle. Final embellishments on this page included a few rubberstamped words (“explore” and “discover” and “summer”) and some stenciling (circles and scroll pattern) using black acrylic paint. It was fun to include on this page the sights, sounds, smells, and feelings I experienced that day, along with photos, sand and seaweed that I collected. Art Journaling, in this case, captured and preserved a beautiful day!